Capitol Hill building in Washington D.C.
During the month of August, members of the House will return to their home states, with senators returning for a shorter period of time (Aug. 6-14). This is a great time to set up meetings or attend local events with elected officials and candidates. Prepare for this year's election with our 2018 election resource. 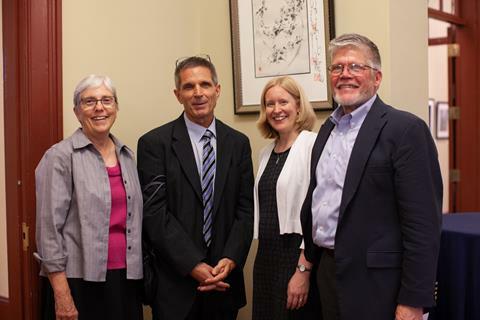 We celebrated our 50th anniversary with an open house and reception at The Hill Center in Washington, D.C. on July 17. About 70 friends, board members and current and former staff gathered for the evening to celebrate and reflect on the first 50 years of MCC’s advocacy efforts in Washington. Some toured the Washington Office building on 920 Pennsylvania Avenue SE, purchased in 2005, during the afternoon open house. Read more. Photo: Speakers at the reception included, from left to right, Ann Graber Hershberger, chair of the MCC U.S. board; J. Daryl Byler, former director of the Washington Office; Rachelle Lyndaker Schlabach, director of the Washington Office; and J Ron Byler, executive director of MCC U.S. MCC photo/Brenda Burkholder. Climate change: On July 19, the House of Representatives voted in favor of a resolutionopposing a carbon tax. While only six Republicans voted against this measure, many Republican lawmakers do favor various carbon tax proposals – just not the specific proposal outlined in this bill. Read more. DR Congo: On July 16 the Senate passed S. Res. 386, which calls on President Kabila to fulfill the constitutional mandate by holding free, fair and inclusive elections in December in the Democratic Republic of the Congo. It also requests that the Trump administration provide adequate needed electoral assistance. Support a House resolution. Immigration: On Aug. 3, a federal judge ordered a full reinstatement of the DACA (Deferred Action for Childhood Arrivals) program, including new applications, beginning August 23. The Trump administration can still appeal the decision. By the end of July, more than 1400 children who were forcibly separated from their parents at the U.S.-Mexico border were reunited. Hundreds of parents who were deported without their children remain separated but a judge has ordered the Trump administration to find these parents. Thousands of other families continue to be separated through detention, deportation and other measures. Read more in the June-July immigration update. Photo: The Washington Office staff celebrated the Washington Office's 50th anniversary with an open house and reception held in Washington D.C. on July 17, 2018. 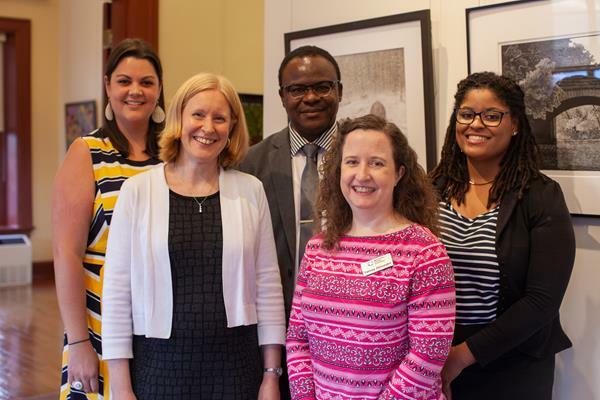 From left to right: Charissa Zehr, Rachelle Lyndaker Schlabach, Charles Kwuelum, Tammy Alexander and Cherelle Dessus. MCC photo/Brenda Burkholder. 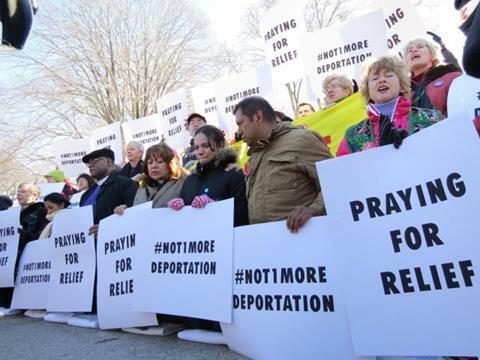 Photo: "Not one more deportation" protest in D.C. in February 2014. MCC photo/Agnes Chen. Visit the Washington Office exhibit at Sing Me High Music Festival, Harrisonburg, Va.
On July 13-15, Charissa Zehr and Xin-Dee Low attended the Brethren in Christ General Assembly at Messiah College in Mechanicsburg, Pa.
On July 21, Whitney Ricker attended the Zero Hour Youth Climate March. On July 24-25, Charles Kwuelum participated in the Ministerial to Advance Religious Freedom organized by the U.S. State Department. The resulting Potomac Declaration emphasized the importance of religious freedom as a human right, and the Plan of Action outlines activities to enhance religious freedom. On July 26-27, Xin-Dee attended a Korea Peace Festival organized by the United Methodist Church. On Aug. 1, Xin-Dee wrapped up her time as international affairs intern this summer. She will return to Messiah College for her senior year this fall. We are grateful for her many contributions to the office.